Construction projects. Pre-school screenings. Food delivery. It's long days of hard work. You'll love it! We consult with local Native American community leaders each year to determine which projects will benefit local residents. Our work is always guided by the needs of the children and families who have limited access to medical and social services. Each summer, we complete two week-long trips, as well as shorter trips throughout the year for medical professionals. Medical and developmental screenings for pre-school children are a requirement for admission to local pre-school programs. The screening team included a pediatrician, registered nurse, pulmonary tech and several pre-med students. 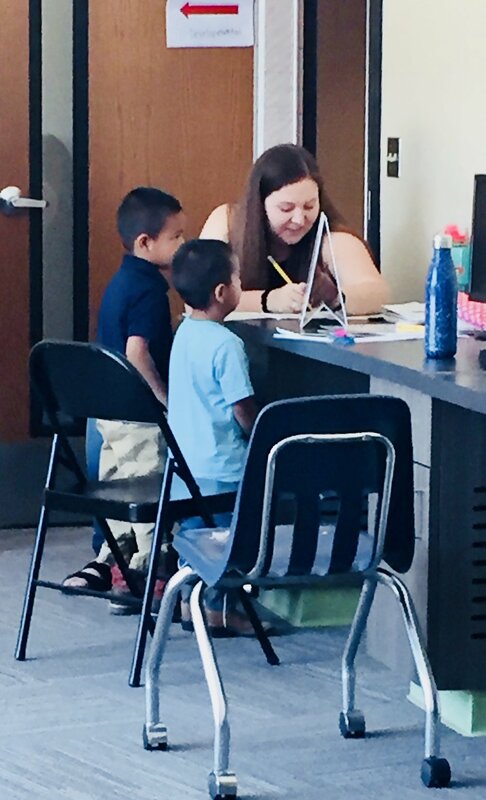 In partnership with Growing in Beauty, our team assisted with screenings, offered a hot lunch and provided craft activities in the 4 locations we visited (Church Rock, Crownpoint, Navajo and Shiprock). Construction. Completely replaced a roof on a hogan that was being repaired. Cleaned a playground and raked new gravel. Outreach. Delivered food and water to Navajo families throughout the Eastern communities of Navajo Nation. Food was donated by the Philoptochos Society at St. George Greek Orthodox Church in Albuquerque. 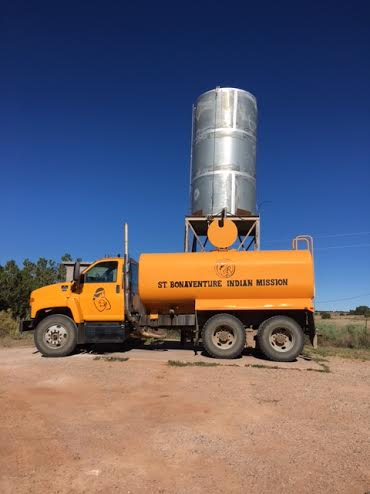 Water delivery is provided by appointment through St. Bonaventure Mission and Dig Deep. Food Pantry. Prepared food delivery boxes and sorted food donations at the Community Pantry in Gallup, NM. Medical and developmental screenings for 75 pre-school children - a requirement for admission to local Head Start programs. The screening team included a physician, dentist, eye surgeon and four medical students. 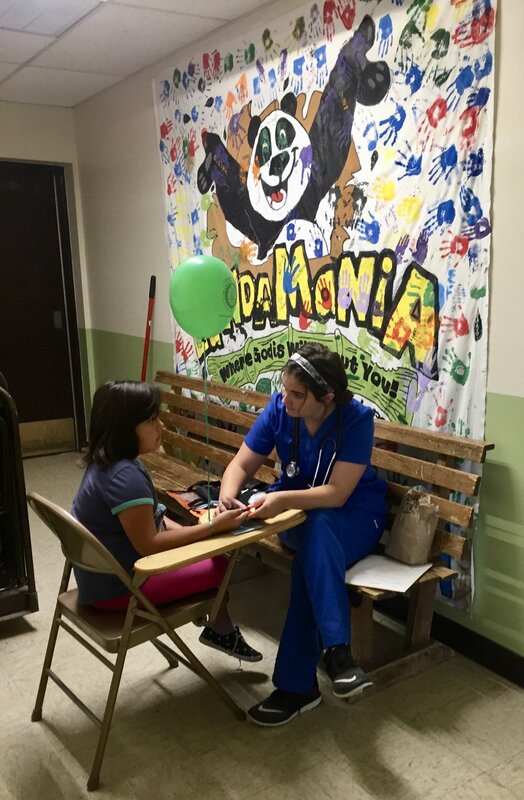 High school and college students assisted with screenings, and provided a hot lunch and craft activities in each Head Start district (Church Rock, Crownpoint, Thoreau and Window Rock). Construction project at a school operated by St. Bonaventure Mission in Thoreau. Our construction staff purchased the building materials and worked in partnership with mission staff to replace a roof. Installed a floor in a hogan (Navajo house) for a Navajo pastor whose wife is dying of cancer. Put solar panel on a roof of a hogan to provide electricity for the first time to an elderly couple. We purchased all building supplies. Delivered food and firewood to Navajo families throughout the Eastern communities of the Navaho Nation. Food was donated by the Philoptochos Society at St. George Greek Orthodox Church in Albuquerque. Delivered water with Darlene Arviso to families in remote areas. Worked in the vegetable gardens at the Community Pantry in Gallup, NM and assisted in serving hot lunches to local residents.